A veteran diplomat is set to take over as China's deputy special representative for Korean affairs, as Beijing seeks to avoid being sidelined on the peninsula amid plans for North Korea to hold talks with both South Korea and the United States, sources said. Ning Fukui, who served as ambassador to South Korea from 2006-08, and was involved in the four- and six-party talks in the 1990s and 2000s, is expected to work under Kong Xuanyou, China's special envoy to Pyongyang and vice-foreign minister on North Korean affairs, the diplomatic sources said. While Ning's appointment has yet to be formally announced, he started work at the Ministry of Foreign Affairs earlier this month, one of the sources said. The post of deputy representative has been vacant since its former holder, Xu Bu, was named as China's ambassador in Chile in January. Finding Xu's replacement was a priority for Beijing, which despite being Pyongyang's greatest ally and patron for more than seven decades, has recently found itself being edged out of the picture in light of the proposed summits between the leaders of the two Koreas next month, and planned talks between US President Donald Trump and North Korean leader Kim Jong-un at a date yet to be agreed. Cheng Xiaohe, a Korean affairs expert at Renmin University in Beijing, said Ning was a "favourable choice" for the role, although he would need all of his experience to help maintain China's position at the negotiating table. As well as Pyongyang's bilateral talks with Seoul and Washington, South Korean president Moon Jae-in has been pushing for a trilateral summit on the nuclear issue. "China is no longer in the spotlight," he said. "So how to ensure it participates in the latest developments is going to be high on the foreign ministry's agenda." At a seminar on the North Korean crisis held in Beijing in November, Ning described the situation on the Korean Peninsula as "one of the most complicated in the world", and said patience and flexibility were needed. "I first became involved in Korean affairs in the 1970s, and I have always believed that the hostility and distrust between North Korea and the US was the major dispute," he said. "Dialogue between North Korea and the US could be the key to resolving the nuclear crisis." Originally from northern China's Tianjin, Ning was one of dozens of young Chinese diplomats who were sent to Pyongyang in 1972 to study the Korean language at Kim Il-sung University. Between 1977 and 1982 he worked at the Chinese embassy in Pyongyang, and returned there as the mission's first secretary and counsellor in the early 1990s. 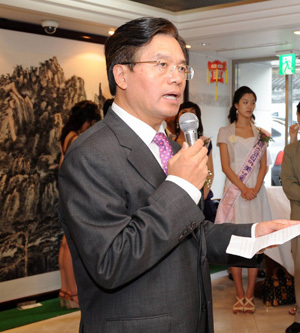 In 1999, he was named as deputy head of the Chinese delegation at the four-party talks between China, South Korea, North Korea and the US – then under Bill Clinton – in Geneva. The summit was held in a bid to reduce tensions in the region after Pyongyang was accused of firing a missile, which it said was a satellite, over Japan the year before. While no tangible results were achieved during the talks, they marked Beijing's debut in multilateral negotiations on North Korean affairs. In 2003, after Pyongyang withdrew from the Nuclear Non-Proliferation Treaty, China, South Korea, North Korea and the US were joined by Japan and Russia for the new six-party talks, at which Ning, who had been working as China's ambassador to Cambodia, was named as ambassador for Korean nuclear affairs. While those talks also made little progress, and ground to a halt altogether when North Korea quit in 2009, China has repeatedly called for their resumption.